I'm still digesting everything so I hope you'll forgive me for not going into too much detail, but it should be enough to say that I gave my first, second, and third public speech, entirely unprepared, in front of almost one hundred children and adults, after climbing up through the clouds to the highest elevation I've ever ascended on foot. I was welcomed and treated like a king. And what had I done to deserve all this? Nothing. I had to keep reminding myself that although I hadn't done anything to deserve such a grand welcoming, my ability to reach the world through my writing gave me a potential that none of them had; I had to constantly remind myself that my life contains such an abundance of opportunity that I needed to find some way to give it back to them. Most of the first day was spent riding on the backs of motorcycles across roads chiseled into the sides of mountains with nothing preventing us from riding off the edge and tumbling to our deaths. Streams poured across sections of the road that had been repaired after landslides returned the Earth to the mountain. A recent landslide left one road with nothing more than a small dirt footpath to cross to the other side. The following two days were then spent traveling by foot to the schools, through fairytale-like green forests, on footpaths sometimes only wide enough for one person. Buffalo, cows, goats, and dogs roamed the lush hillsides. Women and children worked in the fields harvesting corn while men repaired stone roads and worked in the shops. The places where I slept at night were literally in the clouds -- white mist frequently encased us reducing visibility to only a few hundred feet and occasionally the clouds would break just enough to give us a glimpse of the valley thousands of feet below and miles across. The fertile mountains were covered in fields of rice, corn, pumpkins, and potatoes. Tiny homes dotted the landscape. 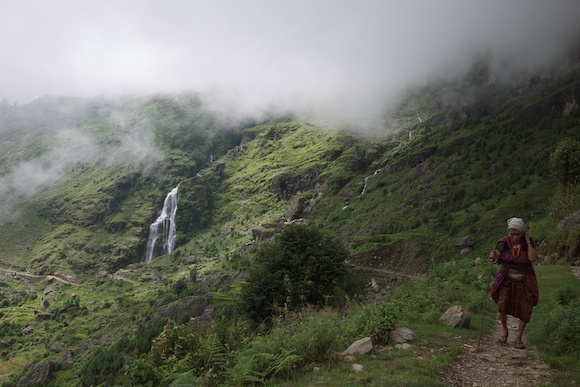 Rivers, fed by the monsoon rains, gushed down the hills creating an abundance of waterfalls and streams. This was the real Nepal. A country where the people had learned to embrace the land and respect it, where they had accepted hardship as a way of life and where the Earth had given them health and abundance in return; a place where sustainability was a way of life. The the land had made the Nepali people tough and rugged on the outside, but on inside they are as soft and warm as the nature that surrounds them. They have a hardworking spirit but an easygoing and laid back approach to life that makes them blend into their environment. They seem to possess a motivation and willingness to do whatever it takes to succeed, a determination seemingly matched only by the majesty of the Himalayan mountains they call home. 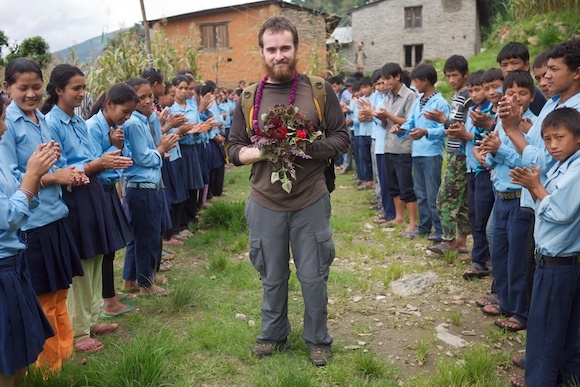 I went on this trip wanting to learn firsthand if Nepal FREED was an organization that I should support. I went with a long list of questions, but I was only able to get some of them answered; the language barrier was a limiting factor. I learned that Nepal FREED doesn't run the schools, but rather deals with the construction of the buildings and oversees the assembly of a committee to run each school. After a school has been set up, they continue helping with funds (when they're available) for employing the teachers and for buying teaching materials. 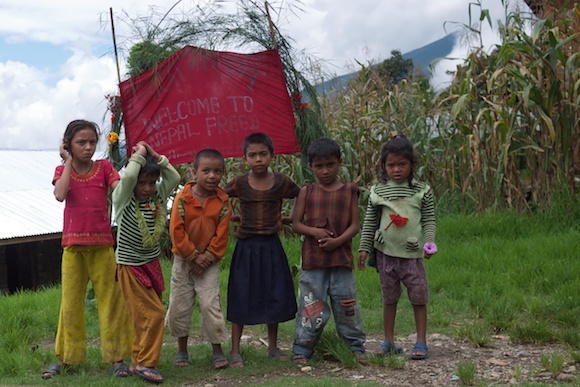 Is Nepal FREED an organization I plan on supporting? Absolutely. Do I have more to say on the topic? Definitely. But I'm still processing everything. In the event that I was unable to get all the questions answered, I planned to use my intuition and just get a feel for what was going on there -- to store everything in my head and go from there. That's exactly what I ended up doing. Over the next few weeks, I will continue writing about my experiences from the past two days and share my thoughts with you as they solidify. That said, my gut tells me this is an organization doing real good and the people running it have honest and honorable intentions. My head is filled with ideas. My emotions are overflowing. My muscles are sore, my face is sunburnt, and my arms and legs are in pain from carrying a 45lb backpack over mountains higher than the highest peak in the Northeast United States. And all this after spending almost four weeks sitting at my laptop drinking coffee from the comfort of a cafe. I'm a firm believer that life presents us with exactly the right opportunities we need to continue growing. When life presented me with this opportunity to visit Nepal FREED, I was given a choice: succumb to my fears of the unknown or put them aside and see where it took me. Yet another step on the journey, now behind me. Fear is the only inhibitor to inner growth -- it clouds our judgment and crushes opportunity. When we overcome our fears, we open the floodgates for personal development and become capable of changing not just ourselves, but the entire world. Is a shifting perspective changing the reason I travel? Tomorrow morning I leave for Pokhara with a friend to spend a few weeks trekking in the Himalayas. We will likely trek to the Annapurna Base Camp, explore other areas in the Annapurna region, and visit my friends' hometown. My rough plan is to spend the month of August trekking and then take a bus back to India for two weeks. I'll spend the first week of September exploring north India by train and visiting touristy places like Darjeeling, the holy city of Varanasi, and the Taj Mahal in Agra. After traveling for a week on seven different trains, I'll relax at my adopted relatives house in Delhi for one week and possibly catch a classical Indian music concert in the city. On September 10th, my plane leaves to return to the United States. It's a good plan, and it probably sounds exciting and adventurous, but the more I experience the world and the more I see how much help is needed, the less interest I have in doing things just for the sake of doing them. It feels like things need to have a purpose now; like hiking up a mountain to visit a school where the adults of the future are being educated to see if I can help. But don't get me wrong, I still love traveling and exploring. It's just that now it feels like I have a mission and anything that isn't directly helping me work towards accomplishing that mission is just wasting time -- time that is running out really fast for a lot of people. This was originally published on raamdev.com on August 4th, 2010 and has been republished on IndependentPublisher.me for demo purposes. It must have felt very unusual to get that welcome. I’m always wary of how westerners get treated ‘better’ (for lack of a better word) in small or big ways in some places – and the fact that it isn’t really deserved at all. I don’t let it make me feel guilty, but I agree, it inspires some living-up-to. I feel like westerners might be seeing things from the wrong angle: maybe westerners are just interesting, new, shiny; and what human doesn’t like interesting things? I think westerners too often project their insecurities onto the rest of the world, causing them to see things through a lens of their own making. Thankyou for visit our nepal manly my village bhalche and I want to say you are most welcome again in nepal(bhalche).